Moonah - take a bow! A mononymous person is famous enough to be known by only one name. Most of us never quite rise to these dizzy heights though locally our friends and colleagues may know us by our nick name. Some modern mononymous people you will know are Madonna, Prince, Fergie and Penn & Teller, the comedian/illusionist duo. If we go back in time you will have no doubt heard of Napoleon, Rembrandt and Plato. 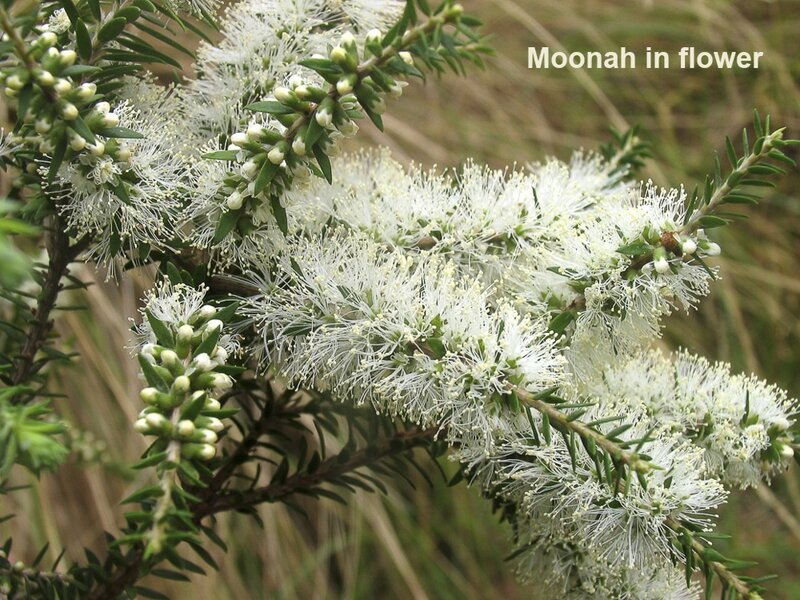 In the botanical world there is only one plant that I know that is universally known by a single common name and that is Moonah, Melaleuca lanceolata. I have a lot of respect for any tree that can live for over three centuries and still look good. There are examples of 300 year old Moonah trees that I know in Maude and at the Moonah Woodlands Nature Reserve at Torquay. 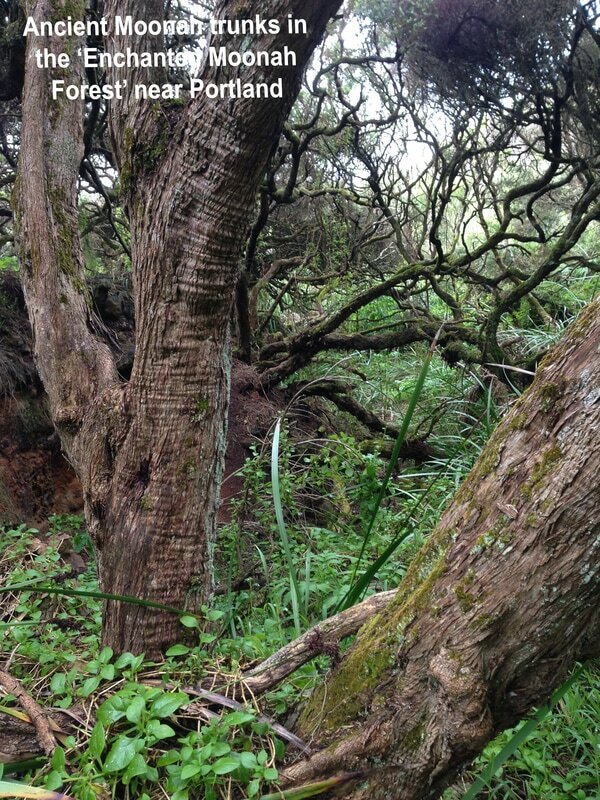 The aptly named Enchanted Moonah Forest near Portland conveys the feeling of mystery and timelessness when walking through a woodland of ancient and gnarled Moonah trees. Moonah can be found in every state of Australia and is most common in coastal areas, though there are plenty of examples of it growing inland. In Victoria it is found as far north as near Mildura and you are likely to see it in the dry regions along the Victorian border with South Australia. 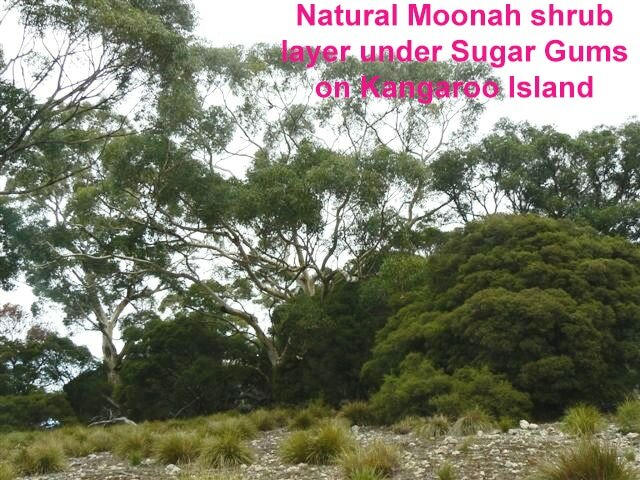 Interestingly, it provides the natural shrubby understorey in Sugar Gum woodlands on Kangaroo Island, which is another measure of its toughness as not much grows under mature Sugar Gums. 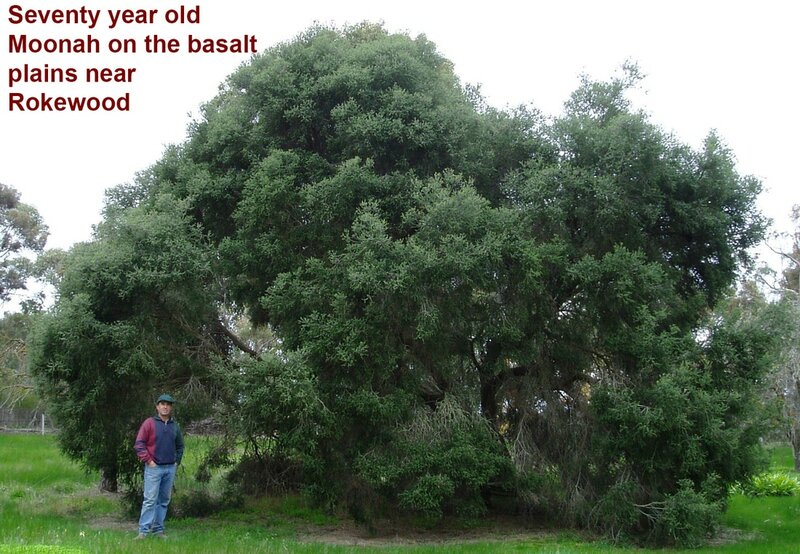 Historically it is recorded as being found in the Barrabool Hills and is likely to have survived in dry, inaccessible areas on poor soils as exposure and heat don’t faze it. When it’s an old tree it is likely to be over 5 m tall with a greater spread, its ancient branches often resting on the ground. Its most distinguishing feature is its twisted and gnarled limbs and like other paperbarks you will see layers of grey bark peeling off, providing perfect nest building materials for birds and mammals alike. Moonah’s bushy habit also make it a safe and protected environment to build a nest and find shelter. It has rods of creamy coloured flowers in early summer though flowers can sometimes be seen as early as October and as late as March. This long flowering period a boon to honey eaters, sugar gliders and possums that benefit from the sweet nectar that is produced in ‘plenty’. It is more than a coincidence that ‘plenty’ and ‘wishes’ are two of the recorded indigenous meanings of the word Moonah. These meanings suggest there are likely to be more useful benefits yet to be discovered. 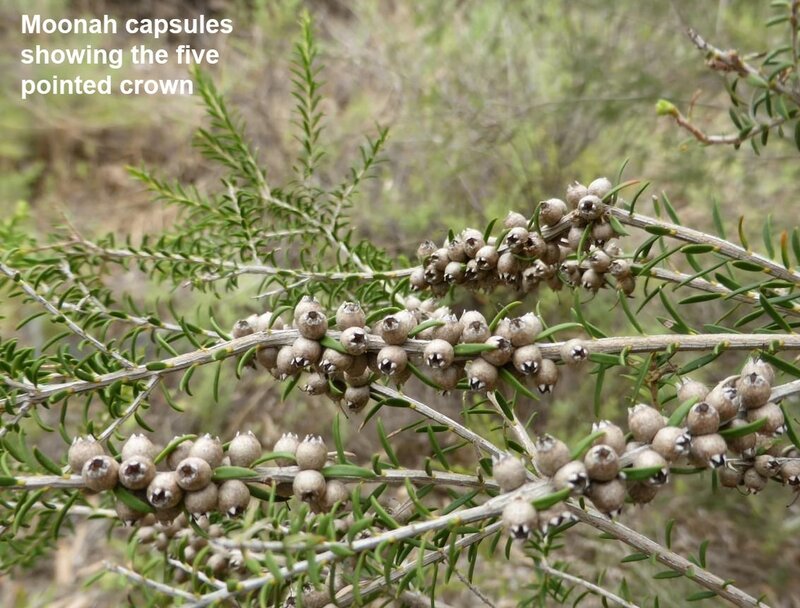 The flowers develop into clusters of rounded capsules each having a five pointed crown suitably befitting the majestic Moonah. Its dull green-grey leaves are small and stiff, tapering to a pointy tip making it very distinguishable. It provides an excellent windbreak on farms and adapts to both heavy and light soils as long as the soils are well drained. It is one of a few Australian natives that does quite well as a single row planting as most other natives do better in mixed multi row plantings where they have the support of other trees and shrubs. When next you’re day dreaming about becoming rich and famous and perhaps Australia’s first mononymous person, take a deep breath and let out your disappointment because there’s an old timer in the back paddock that has beaten you to it by a country mile. Wedge-leaf Hop-bush > that was used to make a unique beer in early Australia. Also the Wet Feet Specialists >, about the local bottlebrush and teatrees which are ideal for planting near waterways.